I couldn’t have perceived it better. The dawn of this new year, as if it were the timing, stirred in me a compelling urge to de-clutter and simplify my life in everything around me. No wonder there’s already a quote on it! Which is also why I chose Bakala Baath (Don’t ask me why the name sounds so!) to be my first post this year – as a symbolic of the simplicity and freshness I am craving to be surrounded with. It is an open secret how much we South Indians love our Curd rice and for that reason, our meals always culminate in some version or the other of this white elixir. Just plain home-made curd with rice and a side of mango or lime pickle sings a perfect happy ending to an everyday meal. A coolant as believed in Ayurveda and thoroughly accepted in the US as well for its probiotic qualities, yogurt aids in digestion and regularizes bowel movement functions. Unlike the American way where food portions are easily classifiable as protein and carbs, Indian cooking methodology has long followed a rather holistic approach where, it is not simple enough to categorize food items separately into the macro nutrient groups. Yogurt however is definitely a major form of protein for us vegetarians and may be due to that, yogurt/curd making has always been an everyday homely affair in India, as it is quite a must for daily consumption, especially down south. 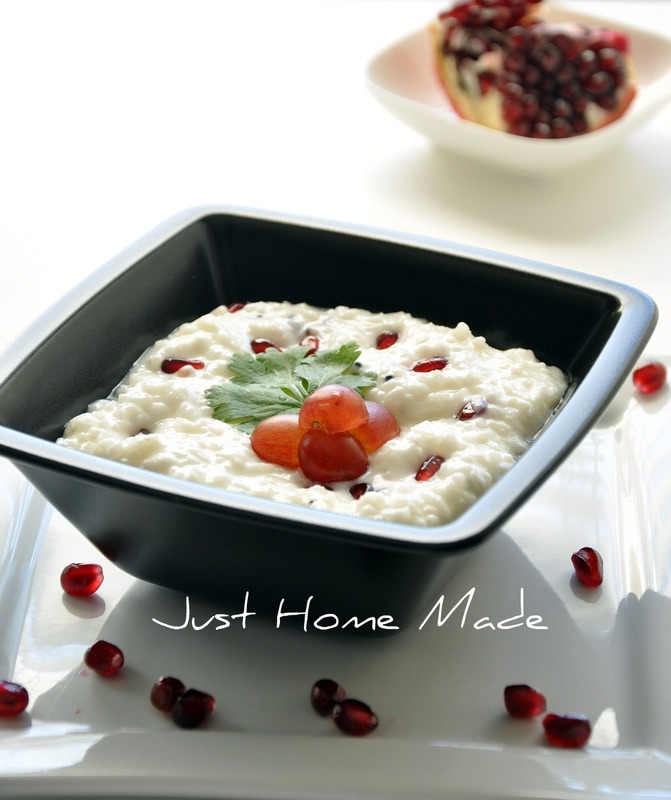 Bakala baath is an exotic version of the humble curd rice – a proof for the fact that contrasting tastes – sweet sourness of the yogurt and fruity sweetness of pomegranate and grapes can not only co-exist in harmony but also deeply satiate all of our senses. Whoever thought of this wonderful combination? I for one, just can’t get enough of the crunch and the juicy bite in this yogurt marvel! And, just so you know – Bakala Baath is one of my latest ‘sneak-in-food’ discoveries (rather realization!) for my pre-schooler who refuses to eat fruits but loves yogurt. Wash the rice well and pressure cook with more than double the amount of water, to over cook it. Once the cooker cools, let the rice cool to room temperature in a shallow mixing bowl. Meanwhile, for the tempering, heat oil in a saucepan/kadai over high heat. When the oil is hot enough (test by dropping a mustard seed or two), add mustard seeds. When the seeds start spluttering, reduce the heat to medium, add urad dal and sauté until urad dal is golden brown. Add hing and keep aside. When the rice has cooled enough, add salt to taste, grated coconut, the tempering and yogurt and mix well. Chill briefly. 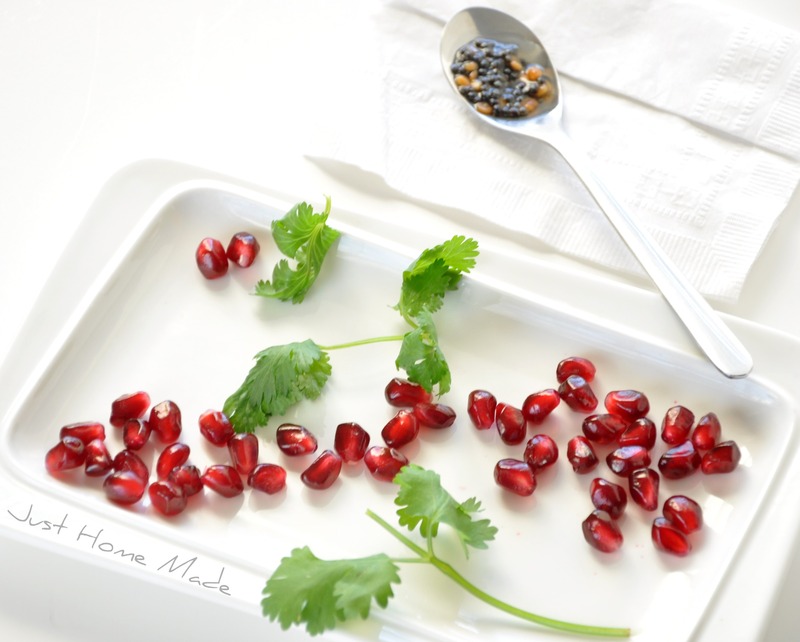 Stir in the milk (to keep the yogurt from souring further) and sprinkle pomegranate pearls, halved seedless grapes just before serving. Garnish with chopped cilantro. Enjoy as is or with a side of your choice of pickle. Do not leave sight of the oil placed on high heat at any point, as it can catch fire when it goes beyond the smoking point. Do not mix yogurt with hot rice as it splits the yogurt. Preferably do not use Basmati rice or any other aromatic rice. Don’t have seedless pomegranate or grapes? Never mind! Add grated carrot and finely chopped/grated cucumber (peeled and seeded) instead of the fruits. Include in the tempering (along with above listed): grated ginger (about 1/4″), 4-5 curry leaves, 1 tsp split bengal gram (chana dal), 1-2 green chillies/red chillies (seeded and chopped) and sauté until green chillies show white spots or red chillies turn brown and curry leaves turn crisp. The seasoned version of Curd rice with just the tempering added are called by different names as Daddojanam or Perugu annam (telugu), Mosaruanna (Kannada) and Thayir Saadam (Tamil & Malayalam). Dadhyodanam colloquially “Daddojanam” is (Dadhi = yogurt + odanam = food, boiled rice) in Sanskrit. Dadhyodanam is also a popular prasadam distributed in temples – amazingly tasty even with minimal ingredients! 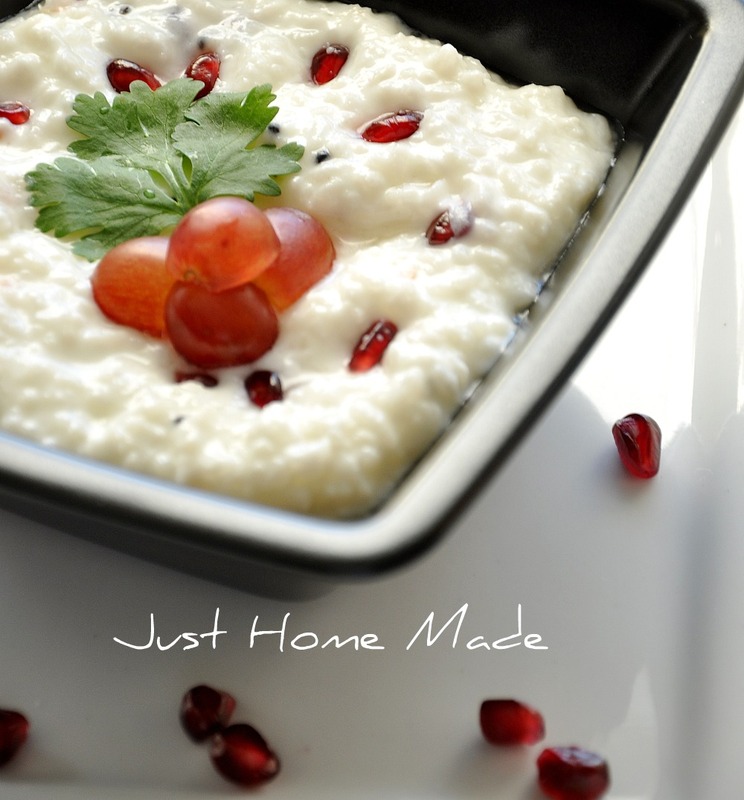 Did you know that curd rice is the common go-to recipe for leftover cooked rice in South India? 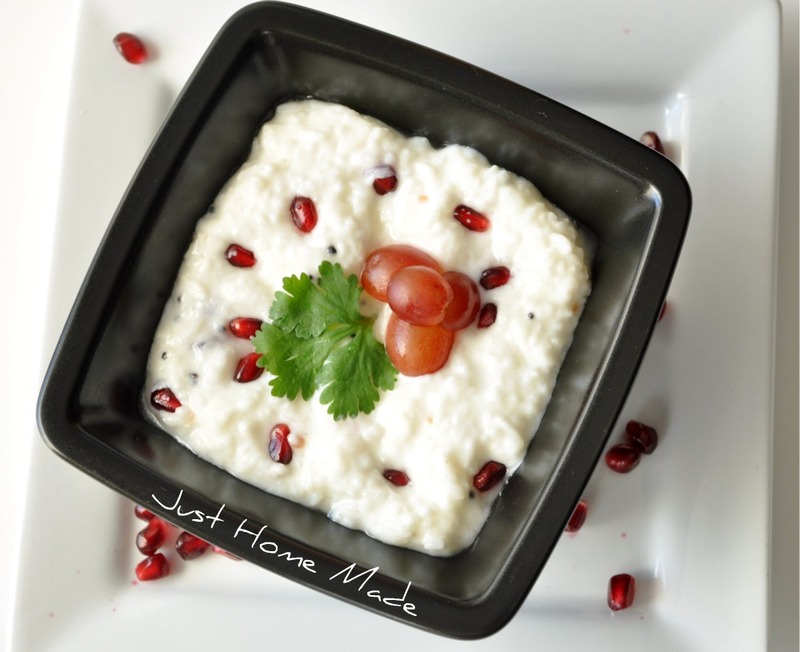 Something similar to curd rice but a bit different. Very attractive pictures. Thank you for linking with Any One Can Cook. Radhika I quickly read through a few of your post and must say I really find your style interesting and informative. Will be coming here often!